To give an idea of what sort of gains the NF-P12 offers, I will be using it as a case fan and measuring the temperature drops caused by the fan. The case I will be fitting the fan in will be an Antec P182. The case is currently cooled by three Antec TriCool 120mm fans. To give a more focused result, I have removed the two extraction fans and blocked one of the vents, leaving a low speed TriCool feeding the case from the front with fresh air. The power supply is fitted in a separate compartment at the bottom of this case, which means that the power supplies fans will not be aiding in the removal of warm air. I will be taking readings from a fixed location approximately 15 centimetres down from the top of the case and positioned equal distances from the sides. I will be taking three temperature values, one for each speed / noise level the fan is capable of. Each reading will be taken three times and averaged over a period of 30 minutes of general desktop use, with around 45 minutes given after introducing each speed adapter to allow temperatures to reach a constant level. I will also include a full speed reading for a Sharkoon 1000 'Golf Ball' fan, which produces a nearly identical 19dB(A) to the full RPM NF-P12 and employs an alternative vortex control system. The ambient temperature was measured throughout and stayed between 17°c and 17.3°c and so all results have been left as taken. As you can see the NF-P12 without any adapters fitted, dramatically reduced the temperature within the case to a very comfortable 20.9°c, which is nearly 2 degrees lower than the Sharkoon 1000. 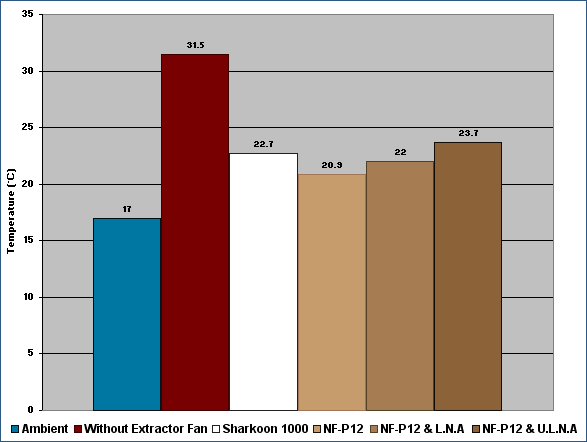 Usually this would equate to an increase in noise but I can easily say that the Noctua's 19dB(A) output is of a more pleasant pitch than the Sharkoon. With the introduction of the low noise adapter and ultra low noise adapter, the temperatures understandably increased but only over a range of 2.8°c, which when you consider the near complete silent operation with the U.L.N.A (12.6dB(A)) is a more than acceptable performance. With the introduction of two extra blades to the fan the static pressure output of the fans will have been increased, which is a welcome improvement over the previous fans. Due to time constraints however, accurate testing of these improvements is not possible. I can say though that when fitted to a radiator consisting of 20 fins per inch it maintained pretty healthy airflow.